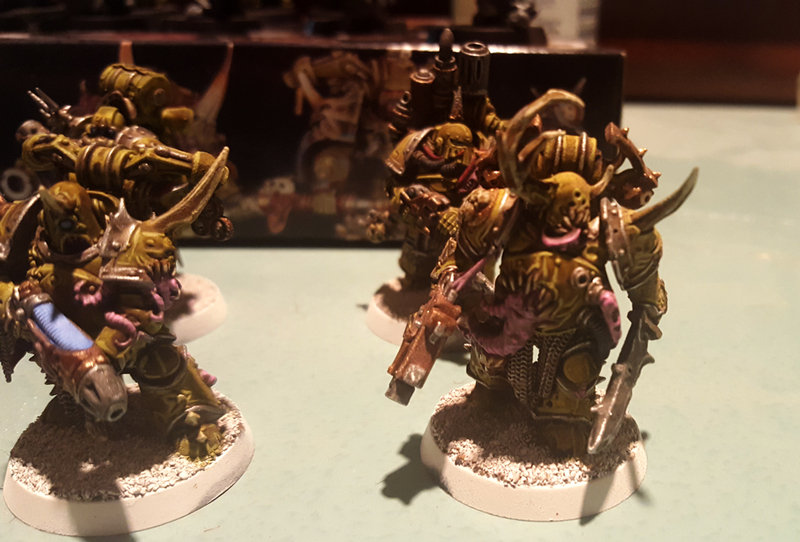 I’m doing a quick update here on my Plague Marines. I’ve gotten all the highlighting I wanted done. It took a little longer than I expected because my time for painting came in short bursts. That led to more wasted paint than I like, but I’m glad to have the ball moved forward. This squad has seen a lot of time on the painting shelf and I’m glad I’m nearing the finish line with them. I apologize about the rough lighting. While I’ve gotten my painting and hobbying space sorted out, I still haven’t gotten around to setting up proper lighting for taking pictures. 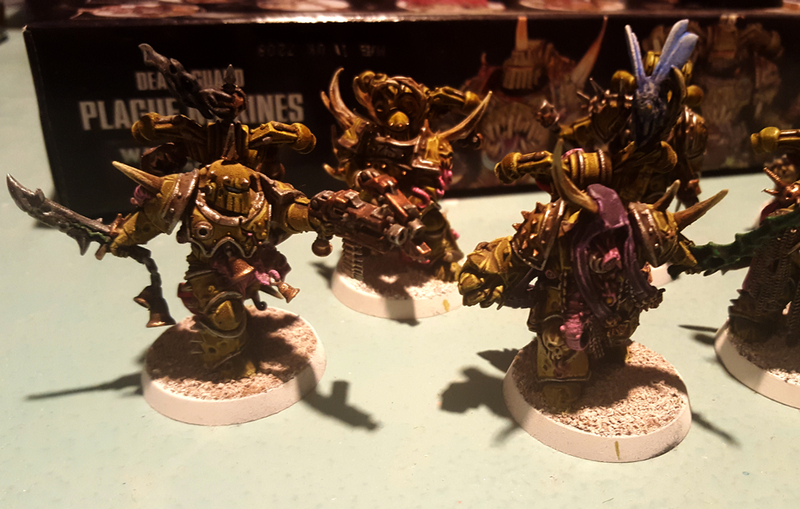 I think the modified method I used to make these Plague Marines look close to my old dipped Plague Marines has worked out well so far. The armor plates are essentially white primer followed by Camouflage Green (Vallejo) base coat, with a heavy wash of Agrax Earthshade, and lastly a highlight with Ogryn Camo. I used the Army Painter’s Plate Mail Metal for the trim and used Runefang Steel to highlight it. On the guns, I used Leadbelcher with Runefang Steel again for highlights, and Hammered Copper (Vallejo) for the gun casings with a highlight of Sycorax Bronze. Those basic colors were used for the big portions of each model. The details on the models varied quite a bit. Some had shrouds others didn’t. Some had pipes and exhausts on their backpacks and others didn’t. That made them a little harder to paint in an assembly line fashion once I got past the basic parts. One thing I think I did a little too much was rely on the fleshy pink scheme for the tentacles, cable coverings and anything else that seemed fleshy and squishy. I used the same scheme on parts that were more or less internal organs (that were now partially external) and I probably won’t do that in the future. While it does actually help create a uniform look for the models as a group, when you look at them individually, some don’t seem quite right. For the plasma gun grill, I just used the Guilliman Blue glaze over the white primer. I like how it turned out as it is close to the coloring on my older models. One of the things that was tough with these models was that the primer didn’t seem to hold the paint on some edges. Even the lightest rub could cause paint to come off. 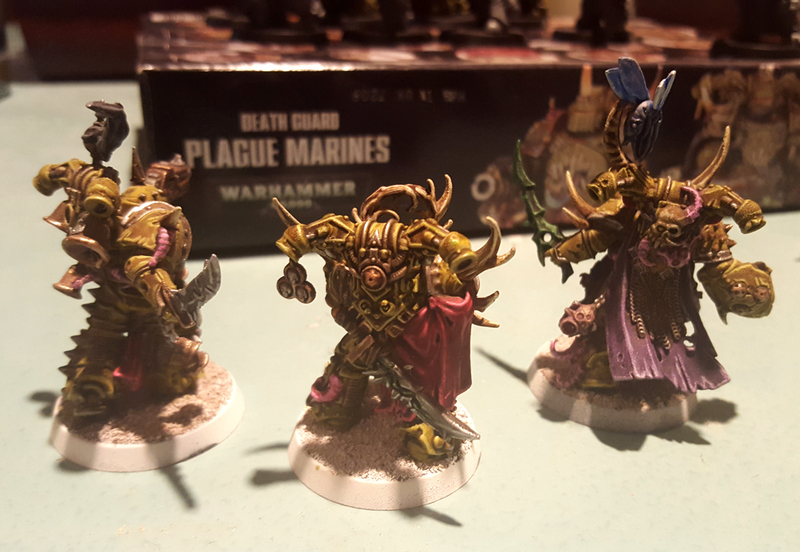 So on a few of the models, the champion’s shroud for example, I had to go back and repaint edges several times. This got pretty annoying after a while. I’m not sure if it’s something to do with the primer I used or if the models’ sharp edges were the problem. I was using the Army Painter’s white primer and I might switch that for the next batch just to see if the same problem crops up. 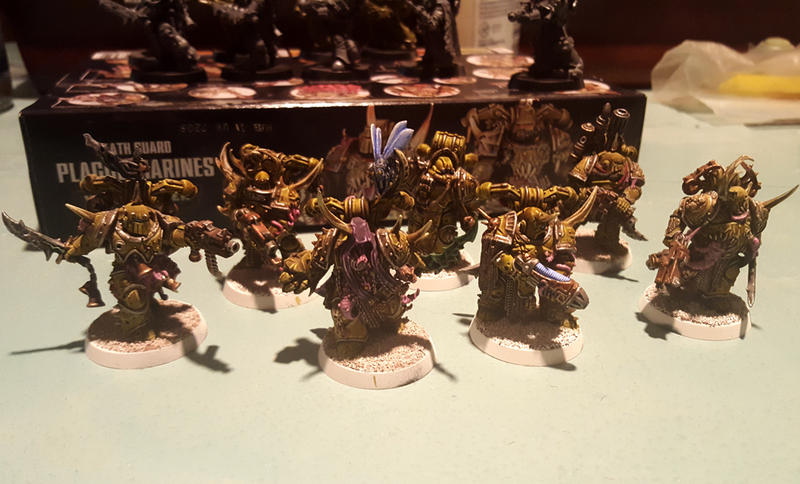 Thankfully, I’m at the stage now where I’m about to seal the paint on these Plague Marines, so I won’t have to worry about paint rubbing off anymore. I’m going to use ‘Ardcoat for the main varnish and Lahmian Medium to take the shine off. That should protect the paint job pretty well. I’ll post again once I’ve gotten them done.